Exhibits We Love :: LEE QUIÑONES - "If These Walls Could Talk"
If you’re in L.A. this weekend, make your way over to the Charlie James Gallery in Chinatown to check out street art & graffiti pioneer Lee Quiñones’s first ever solo gallery show in Los Angeles called “IF THESE WALLS COULD TALK”. Four decades on from his influential mark on New York City’s graffiti movement of the late 1970s that eventually pushed the illicit visual vernacular of the subway graffitists through the lips of contemporary art society, Lee Quiñones has created intimate new works meditating on the passage of time and the organic process by which meaning speaks through his artistic practice. IF THESE WALLS COULD TALK consists of a series of framed “tablets” – writings on slabs of drywall and wood paneling that once were the walls of Quiñones’s studio(s), which were painstakingly removed during recent years. 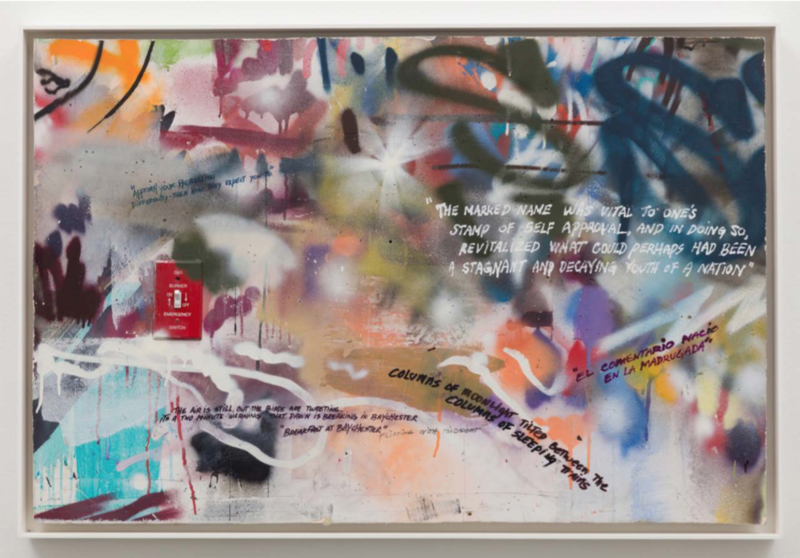 Unlike the urban landscape largely hostile to his earliest artistic production, these walls have offered an inviting interiority for the artist to perform his spray bomb color tests that ultimately become the foundation of his paintings.